Sure, his pieces aren’t everyone’s cup of tea (you certainly wouldn’t find one in our apartment). However, what surely can’t be argued about is the fact that Mr. Ross was one of a kind character on public television who developed a “formula” for producing quick oil paintings of landscapes. What he was probably just as well known for, were his commentaries, along the lines of (try to imagine a calm, soothing voice) “hey it’s your world, you can draw a tree here if you want to, do you want to? let’s draw a happy little tree right here…, let’s give the tree a friend, everybody needs a friend”…and so on. We cracked up over his monologues so hard we had tears in our eyes and our sides started hurting. What was this guy smoking? The hosts had done an amazing job in organizing and setting up the brunch buffet, leaving little to be wished for. From a to-die-for-cheese-platter, various tarts and quiches, prosciutti, fruit salad, little extravaganzas such as hot fig mustard and on top the best “Bircher Müsli” I have ever had (Dagi, you promised me the recipe… ;). Did I mention the fantastic champagne? Oh boy! Can’t have brunch in Bavaria without plenty of “Weißwürst und Brez’n” to go with it, so we had those, too. I could have eaten all day!! Food happiness all-around! 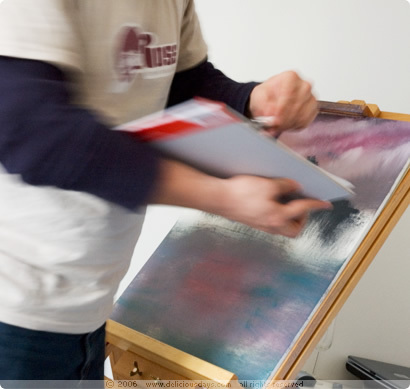 A new talent is proving his skills and may -with a little refinement- become the new Bob Ross. Way to go Carol! Lightly mix fresh yeast, sugar and lukewarm water. Allow to rise for about 30 minutes. Put the flour and the salt in a separate mixing bowl, add the olive oil, make a well in the center and add the yeast mixture. Knead by hand or use your kitchen mixer (dough hook) and if necessary add more flour to keep the dough from sticking, until it becomes smooth and elastic. Dust with a little flour, cover with a clean dish towel and let rise in a warm place again for roughly an hour. Punch down and knead dough by hand for about a minute, roll out thinly, dusting the board with flour as necessary. How thin, really depends on how you like it best: thin and crisp or a little thicker…up to you. 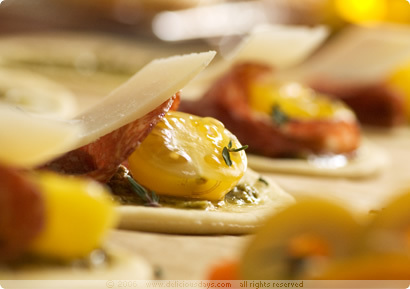 Use a cookie cutter to stamp out your mini pizza shapes (we used diameter of 8cm/3inch). Place them on your baking tray, lined with parchment paper (I prefer to use a pizza stone, but for the many little ones a good ol’ tray makes handling them much easier). 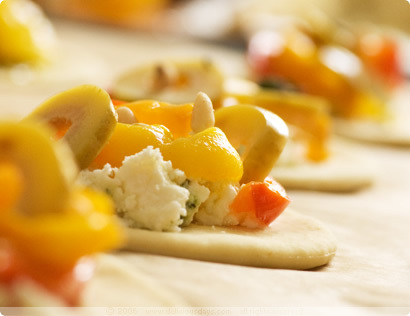 Arrange your toppings on each individual pizza and bake in the preheated oven for 5-8 min. at 220°C/430°F. For the toppings, we’ve tried the following combinations: mascarpone gorgonzola – pears – honey (our favorite), goat cheese – figs – pine nuts, feta – roasted bell-peppers – green olives – pine nuts, pesto – salame – yellow cherry tomatoes – parmesan – fresh thyme. Info: The recipe for the pizza dough used here isn’t any different from what I use when making our regular sized pizza. The time the dough needs to rise is key, so taking a shortcut will likely be at the expense of quality. Other than that there’s not much mystery in it and it certainly doesn’t require rocket science to make an amazing pizza! I could hear Bob's voice narrating the whole post! What a nice gathering, great food and great company! Love the photos! I used to watch Bob Ross all the time... the perfect, soothing voice to put me to sleep. That is so hilarious, I love Bob Ross...with his groovy afro and his calm voice...he just seemed like a really nice guy with the most hideous paintings in the world...but yet it made him happy. 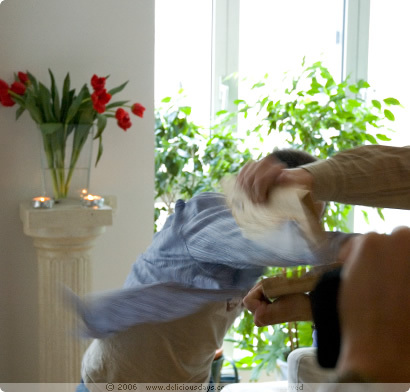 I think that is the best theme for a gathering, I want to know where you got you T-shirts! 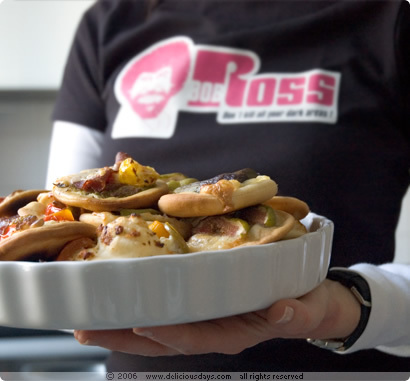 Mini pizzas are such a good idea..everyone could take their own mini pizza and let their inner-bob ross come out with the toppings. A-Bob-Ross-Brunch! What-a-great-idea! Despite he is the Midnight-Man for me: Coming home from a good nightout with nice people, delicious food and smart discussions, ignoring the shout of my bed, grapping some ugly food (Haribo Marshmallow mice for example) and turning on the TV just looking and listening how he is doing his weird thing right in the night, knowing that right at the moment some other nighthawks out there are just looking an listening too - pure passivity. No question, what kind of drugs he took - he is the drug! Saying that: Any chance to get your waffle recipe? And: We want to see The Weißwurst! Real Bob Food! Looks like a fun event! Beautiful photography, everytime I visit. Since I haven't done homemade pizza for ages, I'll give your variations a try. Gorgonzola-pear sounds like an intriguing combination! There was something so wonderful - albeit a little scary - about coming here and finding that familiar face and voice on TV, creating happy little trees against blue skys with titanium white all over Germany. The Germans, bless 'em, didn't even dub his voice out. They understood the power of his hypnotic drone. His syndication ties the world together and just draws it a little bit closer together. We may speak different languages, but we all share in Boss Ross. Never heard of Bob Ross:( But I love the photos, and I would really-really-really appreciate a recipe for those delicious-looking blueberry waffles!!! No doubt about it Sebastien, Bob Ross and Space night are the two best things ever on German TV. My boyfriend once made me the gift of a Bob Ross episode soundtrack that he'd somehow converted to mp3. It is the most hilarious thing ever, and perfect for falling asleep to. I highly recommend it to an insommniacs out there. Oooooh, please get the Bircher Muesli recipe and post it. I keep making it and while my recipe is good, it's not great. I have a nagging feeling that making it great ivolves adding triple fat cream or something, although I hope not. P.S. I remember Bob Ross and his happy trees. He was indeed hilarious! First time commenting here.Beautiful layout and excellent photography. Started my own food blog on Indian food and I sure could do with some great inspiration from your blog. I would be honored if you could drop by my blog Sailu's Food sometime. That's so funny, as a child I used to watch Bob Ross every Saturday morning on public television! Something about his happy-little-everything mentality convinced me everything was right with the world, even though it didn't compel me personally to pick up a paintbrush! Did you ever hear of the scandal he was supposedly involved in? Apparently somebody sued him for all he was worth for stealing the 'wet canvas' painting technique. Ah well, water under the bridge by now! Your pictures of the meal are gorgeous, and the pizzas are such a wonderful idea. Hi Sebastian, Haribo marshmallow mice and Bob Ross after midnight, what a combo :) I think you're right on him being the drug, everybody seems to agree that his show is the panacea for a stressful day. Oh, and regarding the waffle recipe, I'm sure I can twist N's arm and we'll have them again on the weekend [and take notes as we measure]. PS: If I can make it past 24:00 tonight, I'll check out your TV-show recommendation (or make the VCR stay up)! Jennifer, The Gorgonzola-pear I can recommend warmly to you, it's a must try. If you're generally into the cheese/fruit combo, you'll love it! Megan, I'm so with you on the dubbing issue! What's up with all the flicks and shows being translated into German? Glad we have our regular Friday night sneak preview routine and get to enjoy the originals. 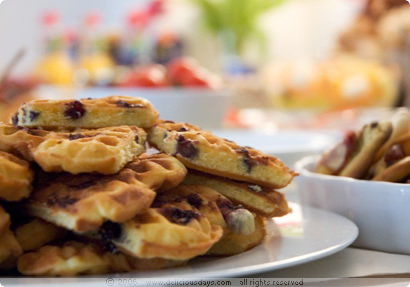 Hey Pille, I'm sure we'll soon post about those blueberry waffles and in fact will cover the recipe from two angles. This batch we made without milk, due to a friends allergy and it tuned out great - but of course we also love our regular ones...meanwhile you can also checkout these strawberry waffles. Hi Debjani, B.R. on mp3 - cool. By the way, when N. read "Space Night" she got all shiny eyes..she runs the music department in our own four walls and she's totally into it! Hi Melissa, Wow never heard of that story, but it's not really surprising (whether legit or not) considering what one can be sued for these days. Hot coffee anyone? just dropping in--heard about you from the bloggies and couldn't resist chiming in about Bob Ross. What a great man. Wonder if he's still alive. Never inspired me to paint anything either just like I may never try a recipe you post on here--still it's enough for me to come and enjoy them. Beautiful work. Your pictures are amazing. I was thinking of making pizza tonight and now it's a done deal since you have me craving it from your photos. Wow. The only thing better than thirty minutes with Bob Ross is mini-pizza. Wonderful post! I can't resist: Bob Ross is dead, long live Bob Ross. But if anyone could have pulled off that hair and beltbuckle in today's world, he was your man. Lovely brunch, lovely photos, lovely setting. Love the Bob Ross brunch idea. Very cool! I remembering always pausing to watch and listen to him for a few minutes as I was channel surfing. Absolutely beautiful photography. What kind of camera do you use? The brunch looks like a success! 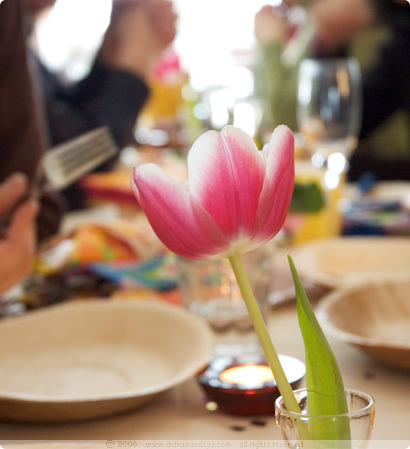 Food, friends, and fun - perfect recipe for a great time. Oh! Thanks for bringing back Rob Ross memories! My brother and I would speak to each other in his voice whenever his show came on :) Sounds like such a fun gathering you had there...with delicious mini-pizzas! Silent cooking? What a fantastic invention! I haven't seen it yet but to my mind it sounds like pure gastroporn. I shall definitely set my alarm clock for 12:40 on Thursday. By the way is Space Night still on? I haven't seen it in years. great post! definitely hosting a bob-a-thon at my house now. DEBJANI: i've been desperately scouring the internet for bob ross mp3s to fall asleep to (I suffer from insomnia), but i cant find any (!). Would it be possible for you to send me some of yours? I am so happy to see that someone is finally appricating Bob Ross and everything that he has done for painting...and awareness of another mind. I learned that trees need friends, and sadly, not enough people give their trees friends. So, thank you Bob Ross and all of his appriciators, for helping America give trees friends! Also, the food looks really good! Bob Ross is the man, period. He has done so much for painting but also for helping me get rid of insomnia. You put on his show and sleep just drapes over me like a veil. I love watching his series and made a selection of them in my Bob Ross video channel on Yubby. Have a look if you get the chance!